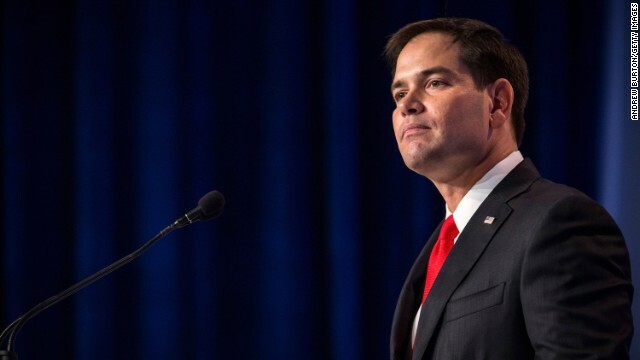 Washington (CNN) – Marco Rubio, the Florida Senator and possible White House contender, will court some of the Republican Party’s most conservative voters with a visit to South Carolina next month. Rubio has been booked as the keynote speaker at Rep. Jeff Duncan’s annual Faith and Freedom Barbecue in Anderson on August 25th, a GOP source familiar with the plans told CNN. It’s Rubio’s first trip to South Carolina, which holds a pivotal presidential primary every four years, since he addressed a South Carolina GOP banquet in 2012. Much of Rubio’s political activity this year has been geared toward helping Republicans take back the Senate in 2014. But this trip appears more directly aimed at shoring up support on his right flank ahead of a possible presidential bid next year. Duncan represents South Carolina’s 3rd Congressional District, a hotbed of tea party and social conservative sentiment that could be considered the most conservative House district in the state. As an added twist, Duncan was a fierce opponent of the comprehensive immigration reform package that Rubio backed in the Senate in 2013 but later backed away from. Kentucky Sen. Rand Paul, another Republican eying the White House, addressed the barbecue last year, drawing roughly 1,000 people to the event. "Kentucky Sen. Rand Paul, another Republican eying the White House, addressed the barbecue last year, drawing roughly 1,000 people to the event." 1. Joni Ernst castrates pigs. 2. Rand Paul dresses himself in baseball uniform. 3. Chris Christie wiggles his .... booty (otherwise known as shows his dance moves). 4. Chris Christie plays baseball (with uniform). 5. Mitt Romney dines in New Hampshire (again). 6. Rand Paul addresses barbecue. 7. Marco Rubio shores up right flank at barbecue Rand Paul addressed last year (with or without right flank). Rotten BBQ drawing flies, got it! -run,run, run, take Mitch or Sarah as Robbing mate too. Pathetic idiot. Appealing to SC Republicans will not make Rubio look sane- to the rest of America. Dumb move. "individual liberty" – I should be able to be bigoted or limit someone else's liberty if I feel like it. "Faith and Freedom BBQ" – My sect of Christianity is Right BBQ. How many Muslims of Faith will be there? "First on CNN: Rubio to court South Carolina conservatives"
We should send National Geographic to film his mating display...some homophobic ranting, followed by a quick foray into misogyny and capped off with blatant racist dogwhistling that builds into a crescendo of delusional anti-Obama talking points. Rubio is not ready for prime time. The problem is that he doesn't think that most of us know it. He thinks the polls lie. This SC person says NO to Rubio. @IMBS, got it from the wall street journal, I suopose now their part if the liberal media now. It was an article that comes up on my phone when scrolling down to the comments section, by wall street cheat sheet, read it and weep! One thousand people? That's a joke! There's double that on any city block. They are wasting their money. Actually the money fools give them. Really he is a contender. At least he is smarter than the Palin- Bachmann sisters put together. What a bunch of hate full name calling liberals/democrats I have ever seen. One post worse than the next. Ive never read republicans spew this much hate in one blog in my life. Rubio will sell his soul to the Devil by pandering to the extreme conservative wing of the party. Time Magazine's Savior of the GOP turned out to be much less than advertised. You don't get out to read very much, do you? Or do you just skip every Hillary Clinton article that you see? Just copying and pasting CNN headlines and/or articles. Try taking your pout to the editors. Oops. Cleared my browser, Me. Above comment was mine. It will be fun ripping him apart for what will no doubt be a lot of pandering that is replete with anti-immigrant nonsense. Next "journalist" on CNN who interviews Rubio should be drawn and quartered if they fail to ask him, point blank, why Cuban immigrants and "refugees" seeking asylum should get all sorts of special treatment but these unaccompanied minors should not.